Download "CALIFORNIA STATE UNIVERSITY, LONG BEACH College of Business Administration"
1 1 CALIFORNIA STATE UNIVERSITY, LONG BEACH College of Business Administration CONSTITUTION OF THE COLLEGE OF BUSINESS ADMINISTRATION (Adopted: September 2000 Last Amended: Spring 2015) Preamble We, the Faculty of the College of Business Administration at California State University, Long Beach, adopt this Constitution in order to establish and define an organizational structure and philosophy conducive to academic excellence, equitable internal governance, and academic freedom. 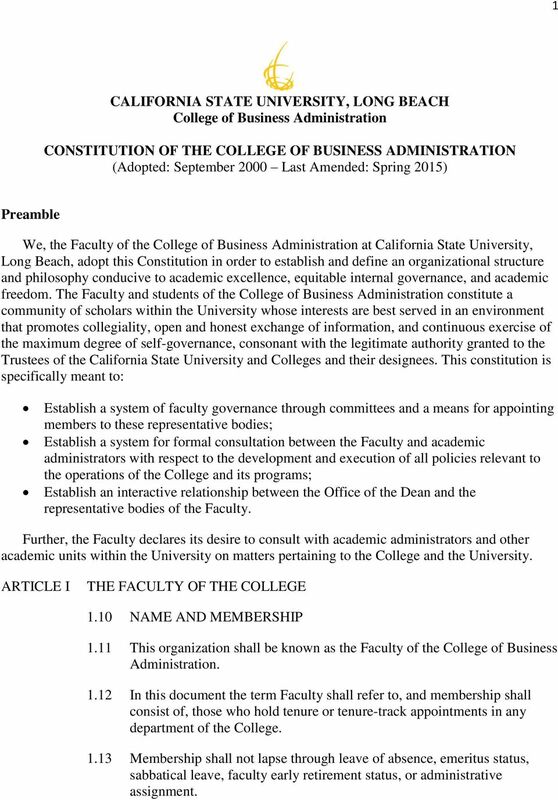 The Faculty and students of the College of Business Administration constitute a community of scholars within the University whose interests are best served in an environment that promotes collegiality, open and honest exchange of information, and continuous exercise of the maximum degree of self-governance, consonant with the legitimate authority granted to the Trustees of the California State University and Colleges and their designees. 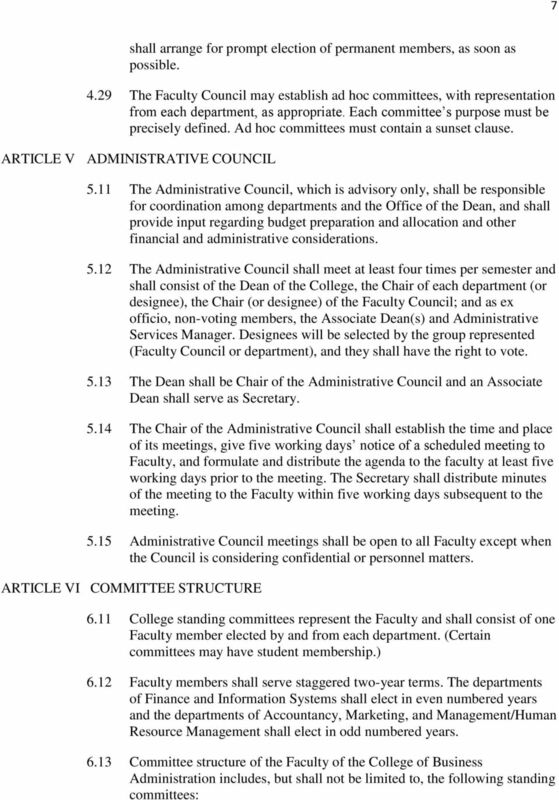 This constitution is specifically meant to: Establish a system of faculty governance through committees and a means for appointing members to these representative bodies; Establish a system for formal consultation between the Faculty and academic administrators with respect to the development and execution of all policies relevant to the operations of the College and its programs; Establish an interactive relationship between the Office of the Dean and the representative bodies of the Faculty. Further, the Faculty declares its desire to consult with academic administrators and other academic units within the University on matters pertaining to the College and the University. ARTICLE I THE FACULTY OF THE COLLEGE 1.10 NAME AND MEMBERSHIP 1.11 This organization shall be known as the Faculty of the College of Business Administration In this document the term Faculty shall refer to, and membership shall consist of, those who hold tenure or tenure-track appointments in any department of the College Membership shall not lapse through leave of absence, emeritus status, sabbatical leave, faculty early retirement status, or administrative assignment. 3 3 meeting, or through the Faculty Council, or by mailed ballot, shall be consulted in the operations of the College of Business Administration and shall participate in the formation of College policies by discussion and voting. This consultation with the Faculty shall include but is not limited to: 1) Admission and retention of students. 2) Curriculum, including establishment of new programs, elimination of existing ones, and creation of interdepartmental programs. 3) Course organization, teaching methodology, textbook selection, course standards, and evaluative procedures. 4) Student grade appeals. 5) Degree, certificate, and minor requirements. 6) Approval of candidates for academic degrees, for certificates, or for completion of a minor in the College of Business Administration. 7) Faculty hiring, retention, tenure and promotion, including of interdepartmental faculty. 8) Designation of College representatives to University councils and committees when such members are selected on the basis of College representation. 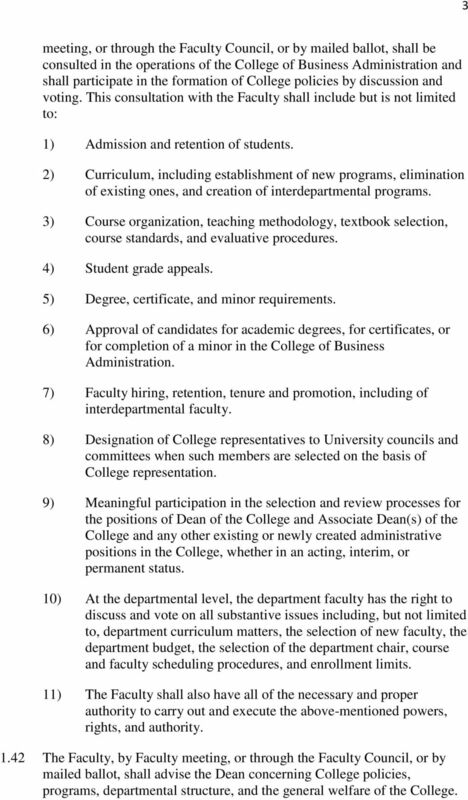 9) Meaningful participation in the selection and review processes for the positions of Dean of the College and Associate Dean(s) of the College and any other existing or newly created administrative positions in the College, whether in an acting, interim, or permanent status. 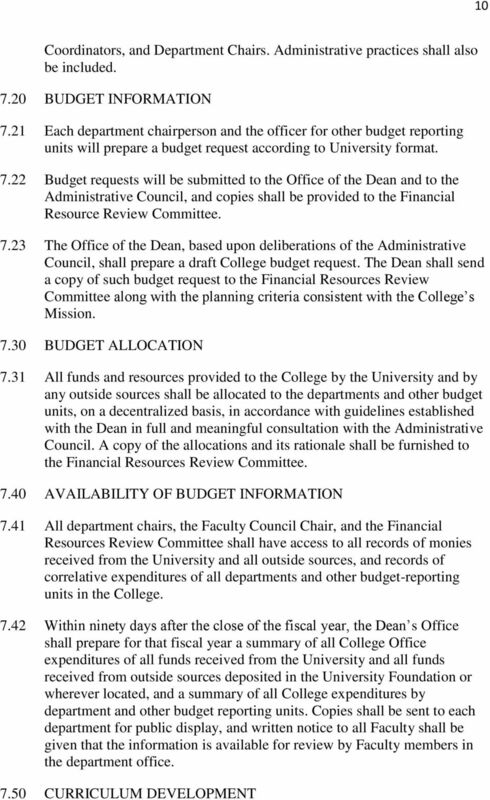 10) At the departmental level, the department faculty has the right to discuss and vote on all substantive issues including, but not limited to, department curriculum matters, the selection of new faculty, the department budget, the selection of the department chair, course and faculty scheduling procedures, and enrollment limits. 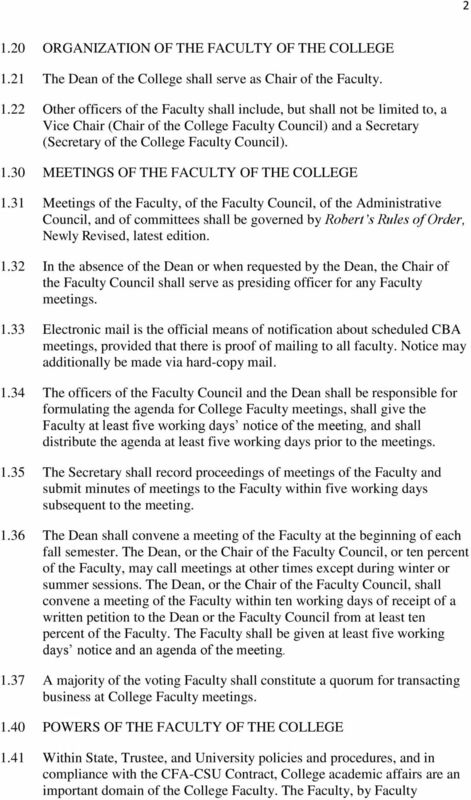 11) The Faculty shall also have all of the necessary and proper authority to carry out and execute the above-mentioned powers, rights, and authority The Faculty, by Faculty meeting, or through the Faculty Council, or by mailed ballot, shall advise the Dean concerning College policies, programs, departmental structure, and the general welfare of the College. 5 5 non-tenure track Faculty, and conducive to the highest standards of student scholarship. ARTICLE III DEPARTMENTS OF THE COLLEGE 3.11 Departments of the College are Accountancy; Finance; Information Systems; Management/Human Resource Management; and Marketing Committees of each department shall have direct access to the Faculty Council, the College standing committees, and the Dean. ARTICLE IV THE FACULTY COUNCIL OF THE COLLEGE 4.11 The Faculty Council shall be the elected representative body of the Faculty, and it shall exercise the rights and powers of the Faculty when the Faculty is not convened in a formal meeting Each department shall elect one Faculty Council member, not currently serving as Department Chair, Dean, or in other major College administrative positions, and the Faculty of the College shall elect three at large Faculty Council members, each from a different department. 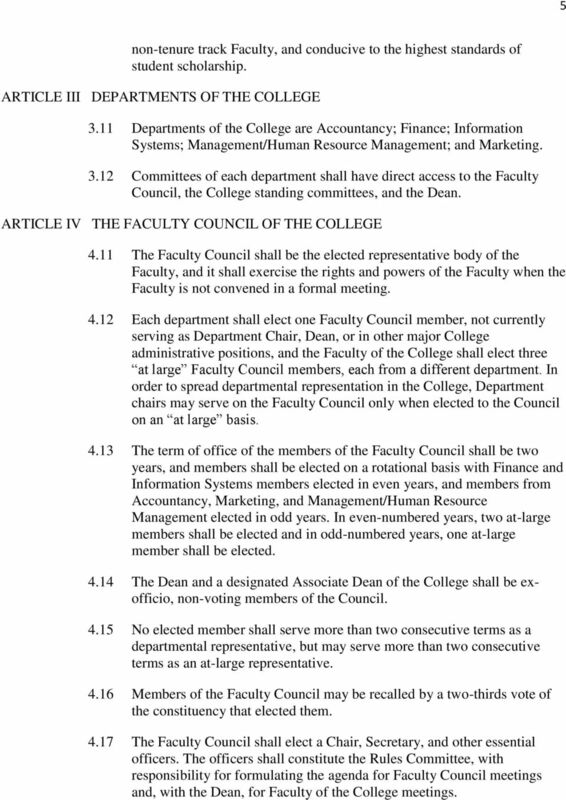 In order to spread departmental representation in the College, Department chairs may serve on the Faculty Council only when elected to the Council on an at large basis The term of office of the members of the Faculty Council shall be two years, and members shall be elected on a rotational basis with Finance and Information Systems members elected in even years, and members from Accountancy, Marketing, and Management/Human Resource Management elected in odd years. In even-numbered years, two at-large members shall be elected and in odd-numbered years, one at-large member shall be elected The Dean and a designated Associate Dean of the College shall be exofficio, non-voting members of the Council No elected member shall serve more than two consecutive terms as a departmental representative, but may serve more than two consecutive terms as an at-large representative Members of the Faculty Council may be recalled by a two-thirds vote of the constituency that elected them The Faculty Council shall elect a Chair, Secretary, and other essential officers. 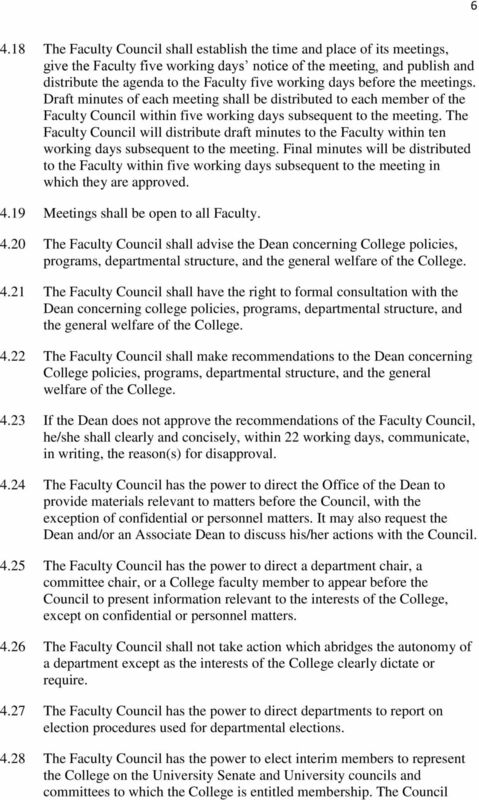 The officers shall constitute the Rules Committee, with responsibility for formulating the agenda for Faculty Council meetings and, with the Dean, for Faculty of the College meetings. 8 8 1) Faculty Council 2) Retention, Tenure and Promotion (members must be tenured full professors and they must be confirmed by a majority vote of the College Faculty on a secret ballot.) 3) Faculty Activities Committee (Commencement, Elections, Human Subjects) 4) Graduate Programs Committee 5) Undergraduate Programs Committee 6) Awards, Development, and Ethics Committee (members must be: (i) tenured, (ii) Academically Qualified within the meaning of the College s AACSB Faculty Qualification Standard, and (iii) confirmed by a majority vote of the College Faculty on a secret ballot) 7) Instructional Technology and Lottery Committee 8) Grade Appeals 9) Financial Resources Review 10) Strategic Planning 6.14 The Faculty may terminate existing standing committees, except those required by University policy, and may develop additional standing committees The Dean, in consultation with the Faculty Council, and Administrative Council, or the Faculty on its own motion (decided by a secret mail ballot or at a duly called Faculty meeting), may develop ad hoc committees as required. 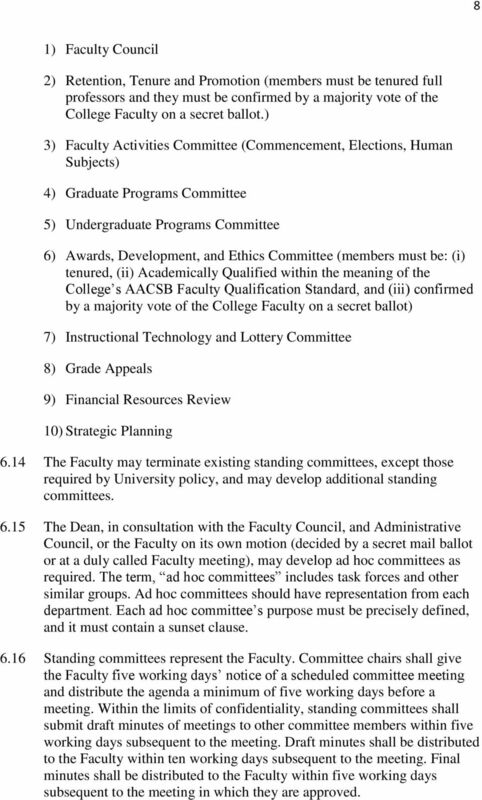 The term, ad hoc committees includes task forces and other similar groups. Ad hoc committees should have representation from each department. Each ad hoc committee s purpose must be precisely defined, and it must contain a sunset clause Standing committees represent the Faculty. Committee chairs shall give the Faculty five working days notice of a scheduled committee meeting and distribute the agenda a minimum of five working days before a meeting. Within the limits of confidentiality, standing committees shall submit draft minutes of meetings to other committee members within five working days subsequent to the meeting. Draft minutes shall be distributed to the Faculty within ten working days subsequent to the meeting. Final minutes shall be distributed to the Faculty within five working days subsequent to the meeting in which they are approved. 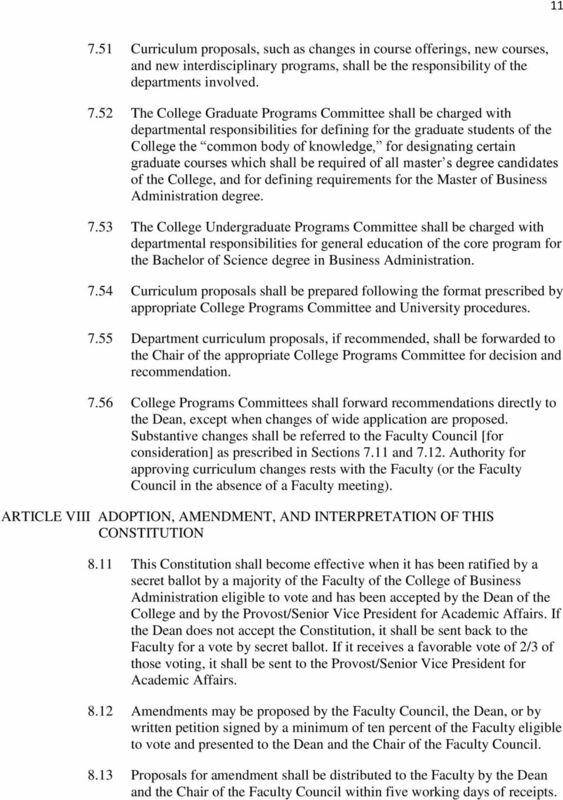 11 Curriculum proposals, such as changes in course offerings, new courses, and new interdisciplinary programs, shall be the responsibility of the departments involved The College Graduate Programs Committee shall be charged with departmental responsibilities for defining for the graduate students of the College the common body of knowledge, for designating certain graduate courses which shall be required of all master s degree candidates of the College, and for defining requirements for the Master of Business Administration degree The College Undergraduate Programs Committee shall be charged with departmental responsibilities for general education of the core program for the Bachelor of Science degree in Business Administration Curriculum proposals shall be prepared following the format prescribed by appropriate College Programs Committee and University procedures Department curriculum proposals, if recommended, shall be forwarded to the Chair of the appropriate College Programs Committee for decision and recommendation College Programs Committees shall forward recommendations directly to the Dean, except when changes of wide application are proposed. 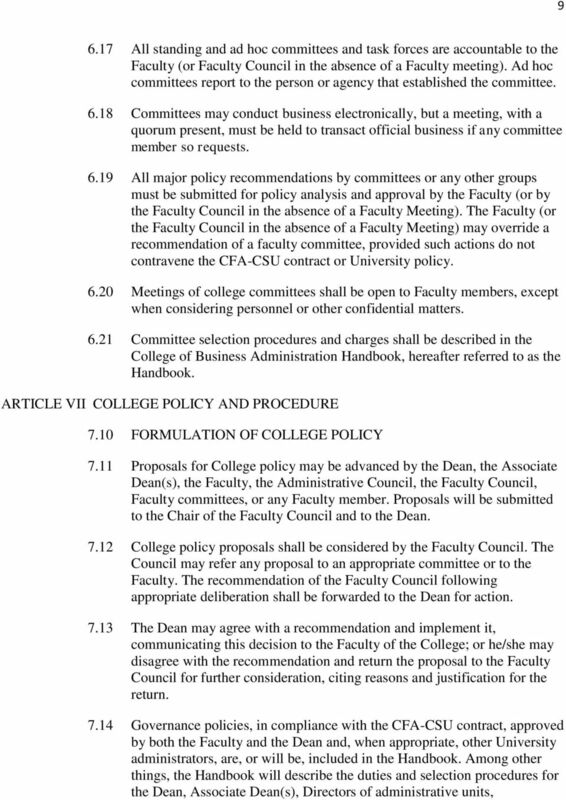 Substantive changes shall be referred to the Faculty Council [for consideration] as prescribed in Sections 7.11 and Authority for approving curriculum changes rests with the Faculty (or the Faculty Council in the absence of a Faculty meeting). ARTICLE VIII ADOPTION, AMENDMENT, AND INTERPRETATION OF THIS CONSTITUTION 8.11 This Constitution shall become effective when it has been ratified by a secret ballot by a majority of the Faculty of the College of Business Administration eligible to vote and has been accepted by the Dean of the College and by the Provost/Senior Vice President for Academic Affairs. 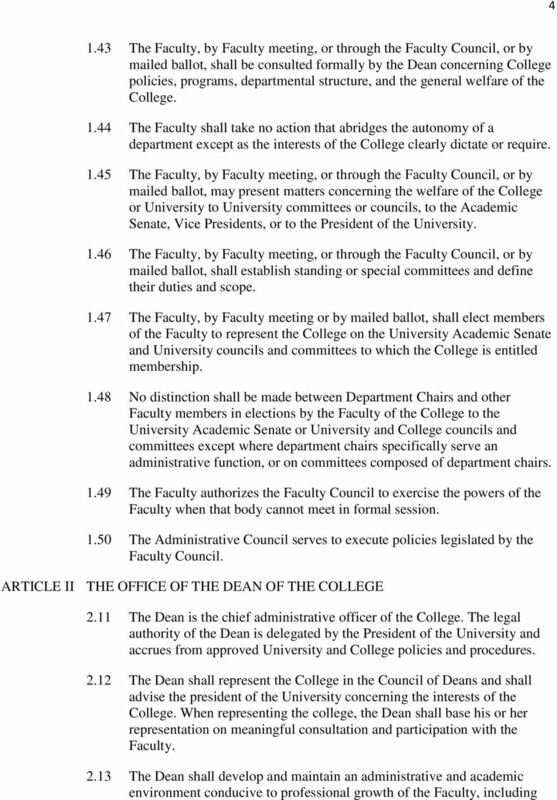 If the Dean does not accept the Constitution, it shall be sent back to the Faculty for a vote by secret ballot. If it receives a favorable vote of 2/3 of those voting, it shall be sent to the Provost/Senior Vice President for Academic Affairs Amendments may be proposed by the Faculty Council, the Dean, or by written petition signed by a minimum of ten percent of the Faculty eligible to vote and presented to the Dean and the Chair of the Faculty Council Proposals for amendment shall be distributed to the Faculty by the Dean and the Chair of the Faculty Council within five working days of receipts. 12 12 A meeting of the Faculty may be called for discussion of these proposals before voting Proposals shall be submitted to the Faculty of the CBA for vote by secret ballot A proposed amendment to this Constitution shall become effective when it has received a favorable vote by secret ballot by a majority of the Faculty of the College of Business Administration to vote.